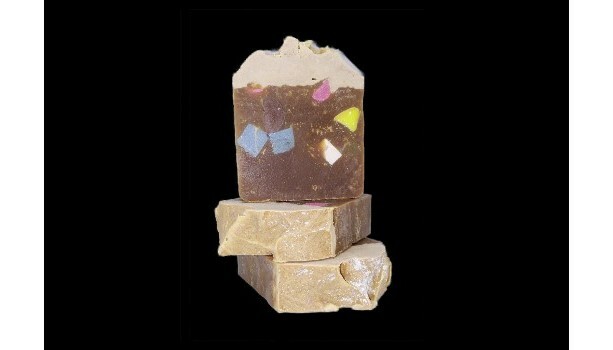 Birthday cake soap brings the fun back to bathing! Smells exactly like a piece of cake! This hearty bar is speckled with colors and topped with glitter. Perfect for kiddos and adults! Please remember to check ingredients for possible allergens. Ingredients: Almond milk, soda, sodium hydroxide, palm oil, cocoa butter, olive oil, sweet almond oil, rice bran oil, castor oil, jojoba oil, carrot puree, cocoa powder, blue mica, pink, mica, titanium dioxide. This set comes with 2 - 5 oz bars. Homemade soaps are known to last longer than store bought soap if they are able to fully dry between uses. And it is SO good for your skin!